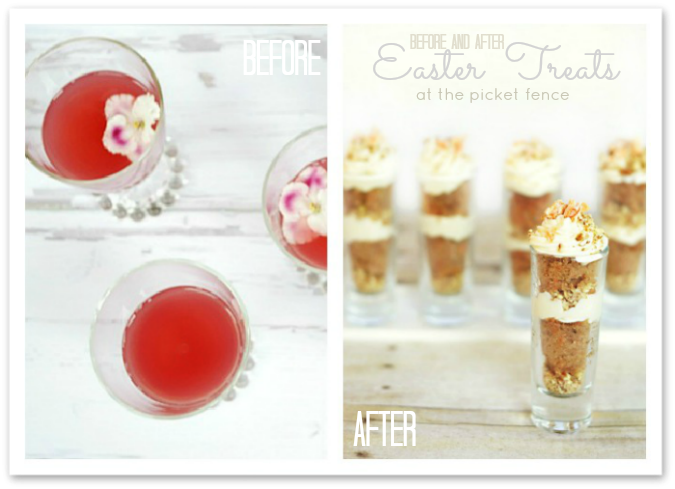 Before and After Easter Treats! We are so thrilled to be joining our wonderful and lovely friends Debbie from Oh So Shabby Debbie and Karianne of Thistlewood Farms in a sort of virtual potluck today. And, let us tell you that this is definitely our kind of potluck! Forget the jello mold with mini-marshmallows on top and “mystery” casserole. 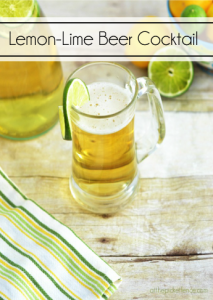 We’re sharing some of our favorite Spring recipes and we don’t know about you but any potluck that consists of cocktails and desserts is right up our ally! Just as the turkey is the centerpiece of Thanksgiving, ham seems to be the centerpiece of Easter or other Spring celebrations. But, we all know the truth, don’t we? That those are just the gateway to all of the wonderful side dishes, beverages and desserts. So, we thought it would be fun to do a “Before and After” project of a different sort today and share some of our favorite new recipes which we believe would be wonderful accompaniments to ham, turkey, pork or anything really! First, Vanessa is going to share with you a lovely Spring Brunch Cocktail which is the perfect way to start off any gathering this season. When it comes to brunch, Mimosas seem to have cornered the cocktail market. 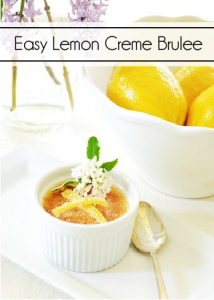 But, I thought it would be fun to try out a new recipe which also brings a fresh pop of color to my Spring celebration. 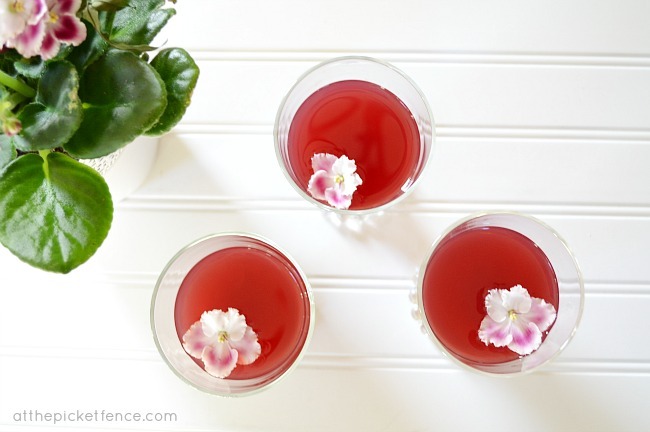 Adapted from a Martha Stewart recipe, this Spring Cocktail shouldn’t be reserved only for Brunch. We even made some to go with our Mexican take-out the other night! Shhhh…don’t tell Martha! 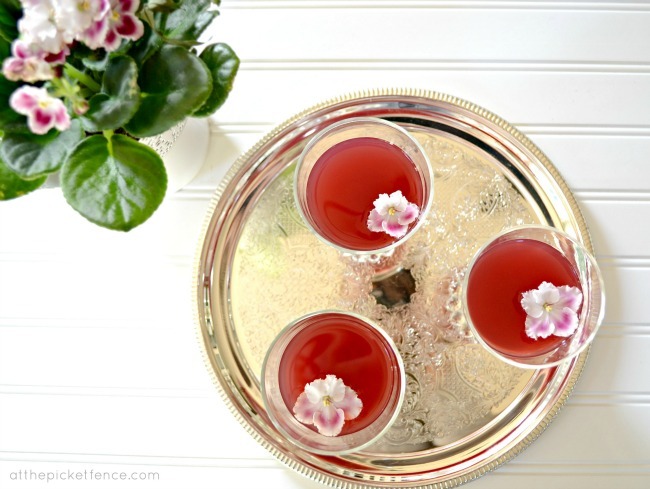 Garnished with a violet blossom (yes, they are edible!) this cocktail looks like Spring personified! 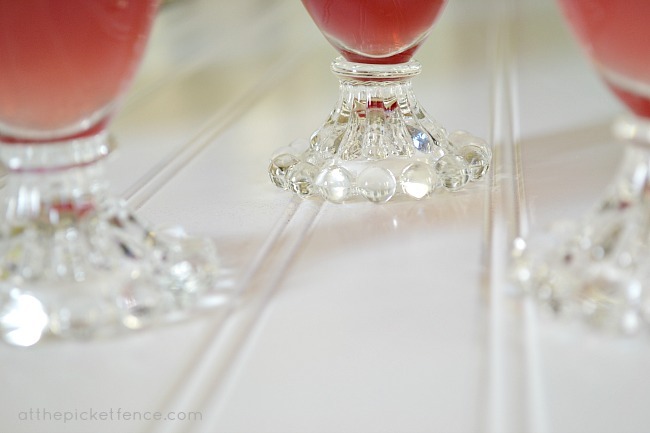 And when served in vintage goblets which were collected for me and my sister by our grandmother, the cocktail almost seems to sparkle! All that’s left is to enjoy them with family and friends! Combine 6 oz. Lillet, 6 oz. grapefruit juice and 3 oz. gin and ice in a cocktail shaker. Shake until well chilled. Strain and divide among cocktail glasses. Repeat. 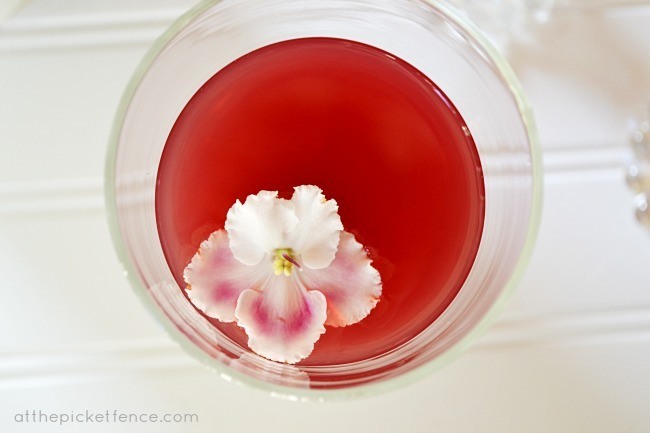 Garnish with flowers if desired and serve immediately. After stuffing yourself on ham and potato salad, sometimes dessert can seem like an afterthought! We often want just a “little bite” of something sweet without adding anymore calories to an already laden meal. Well now you can have your “cake and eat it too”…literally! These Carrot Cake Dessert Shots, filled with moist carrot cake, cream cheese frosting and pecans, are topped with a special sweet treat…candied carrots! 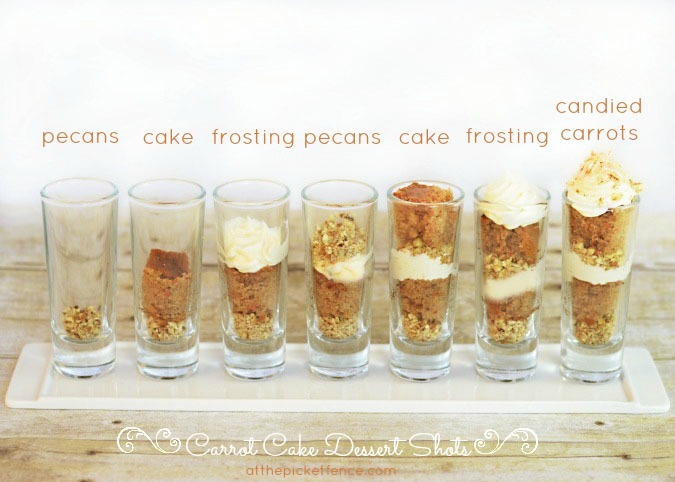 Super easy to make and so pretty to serve, these shots of dessert are a perfect after dinner treat! Here’s the recipe! So, are you ready for two more fabulous Easter Treats! 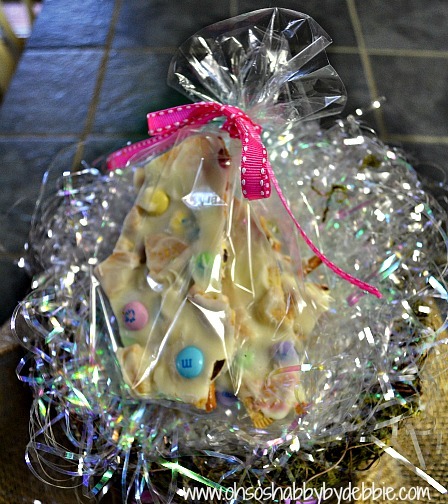 Our dear friend Debbie, from Oh So Shabby by Debbie is sharing her fabulous Easter Bark she makes every year for her grandchildren. Be sure to visit her to get the recipe! 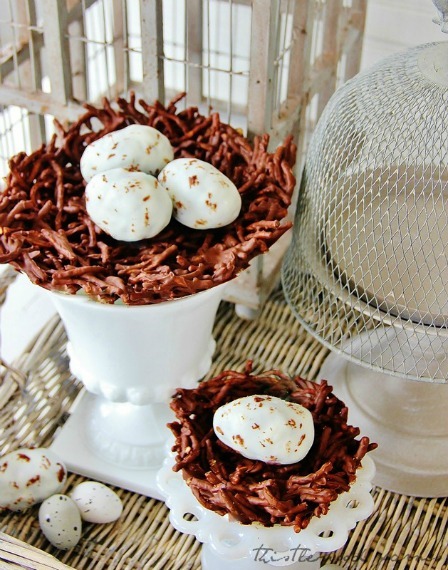 Our BBFF (Blogging Best Friend Forever) KariAnne of Thistlewood Farm, has created these darling Speckled Egg No Bake Oreo Cake Pops in edible nests! 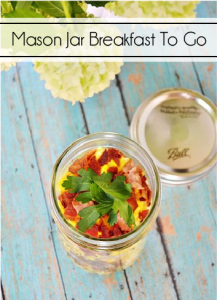 Wouldn’t these be fabulous at the place of each Easter dinner guest?! Be sure to stop by her blog to see a step by step tutorial! Do you have a favorite Easter Treat? Share it with us in the comments! We’ll see you back here soon…at the picket fence! 21 Comments on "Before and After Easter Treats!" You go girls! It looks like perfection from start to finish! Love the edible flowers and the tiny crystalized carrots! So happy to be having a little spring fun with you both and Debbie! Have a great day rock stars! i want to rush right out and get what i need for those c-cake shots……but 1 question….where in the world did you find the the glassware?? I’m thinking some cake pops in fun Easter colors would be the best. I had some cake pops a friend made months ago – she used a yellow cake mix and added a can of cream-of-coconut to it and then dipped the balls in white chocolate. it was a pass-the-plate-and-back-off kind of moment! LOVE carrot cake!! This all looks so yummy and pretty!! What a great selection of recipes to try out for Easter. I love the idea of dessert shots. That is about all you need any way. Great post. Both of these look delightful. Thanks for sharing. Those both look so good. I especially want to try the carrot cake one. 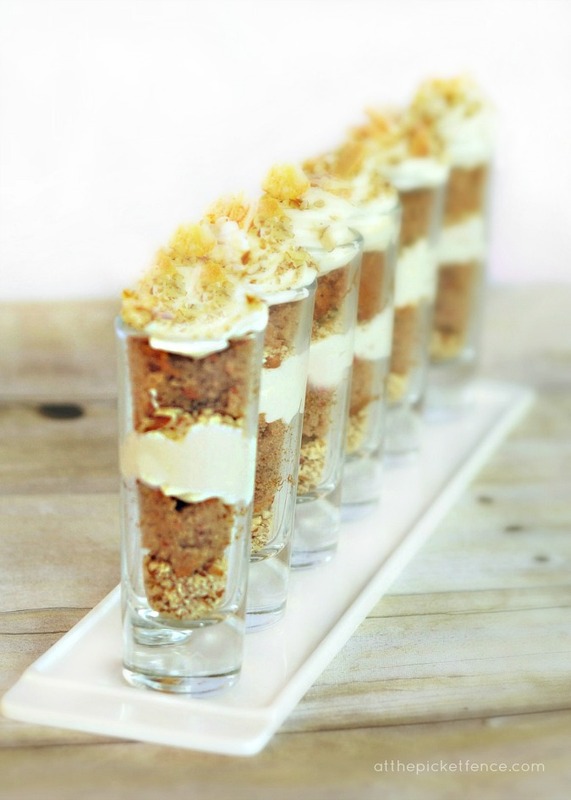 Love carrot cake…and what a great way to serve “just a few bites”…just enough! !….the drink looks wonderful too…love those glasses from your grandmother! Ooo, lots of yumminess, girls! THink I’ll be trying out that cocktail! 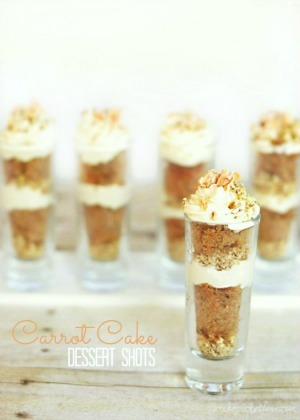 The carrot cake shooters looks amazing! Definitely would love to try it.